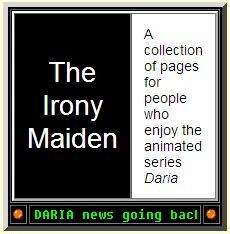 The Irony Maiden was a British Daria fandom website run by Martin Sylvester. It offered news on and television show times for the series, among other information. This website closed abruptly in January 2009. This page was last edited on 31 October 2009, at 10:31.